The ultrasonic sensors are able to fully monitor a vehicle’s rear area while reversing. In the car industry, they have been used for a long time as assistance system. Now Fliegl Scout is transferring that technique to agricultural engineering accessory equipment. Fliegl surroundings monitoring system is not just any ordinary accessory equipment, it is highly versatile – the Fliegl Push-off Trailer ASW. It is equipped with rear sided ultrasonic sensors, so that a full monitoring of the vehicle’s rear area can be achieved. 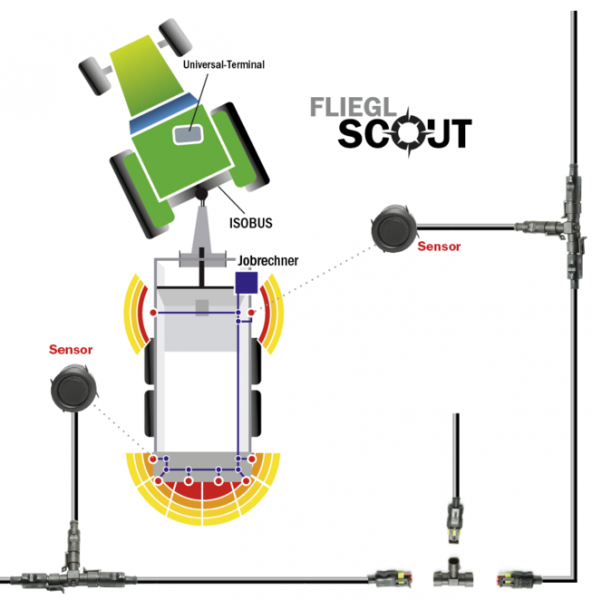 Fliegl Scout warns the driver when he is reversing closer towards an obstacle or a person. The warning tone frequence becomes louder as the obstacle is getting closer, then the tone becomes constant. The driver is warned against obstacles immediately, clearly and insistently. He can react without delay and prevent collisions. What is remarkable is that, thanks to Fliegl Scout, there is no longer any blind spot in the rear area. Fliegl Scout has been built especially for the agricultural use: the ultrasonic sensors can be found in different places on the vehicle so that dirt adhesion can be minimised. The sensors are over-painted, which means that they can be cleaned using a commercial high-pressure cleaner. The system’s wiring works to a large extent via a Lin Bus System: repairs are easier to make because of a single two-pole structure. The plug connection’s connectors are coated with plastic and water-proof. The Fliegl surroundings monitoring system’s output device is the tractor’s own display, which is connected to a Fliegl ConBlue connector via the ISOBUS plug. No additional hardware is required in the tractor cabin. Fliegl Scout is quick and easy to use. A rear alarm signal emits a signal tone outward once the vehicle reverses and warns people at the back of the vehicle. It supports the monitoring system towards the outside and also improves personal safety. Fliegl Scout has a number of advantages over rear view camera: it works without the need for visual attention, it works even under strong sunlight, at dusk and at night. Fliegl scout works by hearing, immediately and clearly. Its purpose: avoiding accidents, making reversing safer using accessory equipment. Fliegl Scout reaches his objective: It is easy to operate and comfortable to use. It clearly offers an additional safety bonus. For more information, please visit http://www.fliegl-agrartechnik.de.